Corliss, in contrast, pretty much states in Life Itself that he wants nothing to do with the filmmakers whose films he writes about. I assume this is out of a sense of cinematic purity, to keep things as objective as possible in a highly subjective profession. Which strikes me as fairly ridiculous, especially since COI has been going on in the arts for far longer than Siskel and Ebert have been household names. Does anyone really think that Jackson Pollock–as great a painter as he may have been–would have ended up a legend had he never met the influential art critic Clement Greenberg, who became both his close buddy and relentless champion? Corliss may have qualms, but I personally see nothing wrong with this setup – provided there’s transparency (such as the disclosure Ebert made in his “Dear Werner” letter). Indeed, we’re now firmly in the digital age, a time when the bottom has fallen out of film journalism and a huge swath of critics have diversified into other film related, and potential COI, areas. Let’s be honest. Many critics are filmmakers themselves, programmers, educators and more, often rubbing shoulders with those whose work they may end up writing about. (Not to mention the publicists – heck, I don’t know how you can’t become at least somewhat friendly with PR folks you deal with on an everyday basis. And this, mind you, has been going on for far longer than the Internet’s existence.) 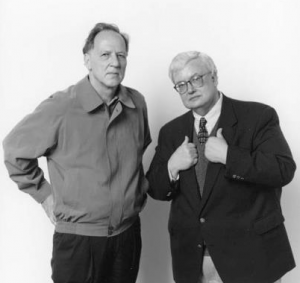 In other words, COI has long been weaved into the very fabric of criticism – not to mention other fields like film festivals, which could use a strong dose of Ebert disclosure. (Perhaps only Corliss would be surprised that even the most “important prestigious” festivals are not above COI. Rule of thumb: if you see a film at a festival that seems to scream “weak link” in the program, stay all the way through the credit roll. It’s the swiftest way to determine who connected with the fest received the favor.) The issue just became more obvious with the rise of the Internet – which is a good thing. And, yes, I know Steve James.